Stacy Sutton, Vineyard Oak Dressage Training, has been successfully teaching and training both horses and riders for 27 years, as well as competing for many years in the disciplines of Dressage and Eventing. 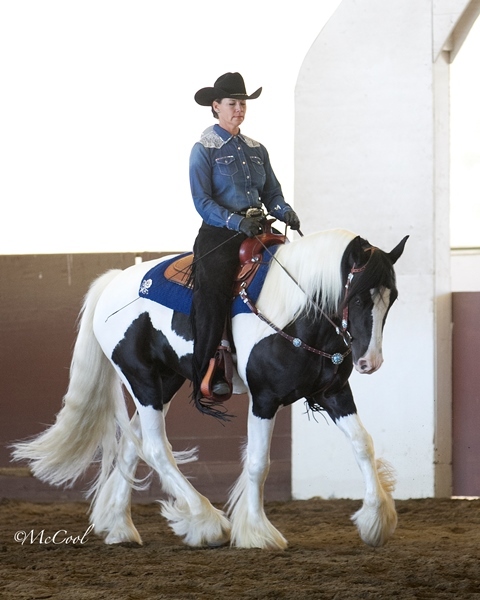 She now focuses primarily on the art of Classical Dressage, Western Dressage, and promoting the Gypsy Vanner Performance Horse. Stacy believes that Western Dressage is a progressive dance, and learning the steps is as enjoyable as the final result. Stacy works with riders of all levels and has a unique ability to address each horse and rider’s individual conformation and body type. She provides an informative and systematic teaching style that breaks down in detail the mechanics of the rider’s position in the saddle, and she can spot seemingly minor errors that can ultimately make a tremendous difference in the responsiveness of the horse. These skills provide students with personalized tools to develop a beautiful and effective seat, thus enhancing the communication between each horse and rider. This also gives the rider and the horse security, safety and confidence. Stacy believes that Western Dressage is a fun way for a rider to develop better skills and enjoy enhanced communication with their horse, whatever its level, age, or breed.